Some 25 years after his college football career, Pellom McDaniels (right) received the NCAA Silver Anniversary Award for his achievements in the NFL, community service and work as a professor and curator at Emory. The award was presented Jan. 16 during the NCAA’s national conference in Washington. Photo by Jamie Schwaberow/NCAA. Also at the NCAA national convention, former Emory softball player Megan Light was honored among the NCAA Today’s Top 10. The award, for students who completed their athletic eligibility during the 2013-14 academic year, is given to 10 students from around the country based on athletic achievements, academic success and community service. Light graduated from Emory College in 2014 with a GPA of 3.95 and majors in anthropology and human biology. On the softball field, she was a three-time All-American and the first player in program history to earn two first-team berths. She established school season records with 19 home runs and 65 RBIs during the 2014 campaign. A four-time selection to the All-University Athletic Association First Team, she was tabbed as the conference’s Most Outstanding Player three times. She hung up her Emory uniform ranked among the program’s all-time top 10 in 12 offensive categories including first in home runs, hits, doubles, RBIs, total bases and slugging percentage. Light was a recipient of Emory’s Brittain Award, the university’s highest student honor, which recognizes a graduate who has demonstrated exemplary service to the university and the greater community. She was also named the 2010 Atlanta Sports Award Female Scholar Athlete of the Year and went on to earn the 2014 Charles Shepard Scholarship as she pursues her graduate degree, in addition to an NCAA Postgraduate Scholarship. Light was also one of nine finalists for the NCAA’s 2014 Woman of the Year Award. She is now a graduate student at Emory’s Rollins School of Public Health, studying global health with a concentration in public nutrition. Twenty-five years ago, Pellom McDaniels was a football player and speech communication major at Oregon State University. After playing in the NFL, launching two charities, and earning a doctorate, he is now curator for African American Collections for Emory’s Manuscript, Archives, and Rare Book Library (MARBL) and an assistant professor of African American studies. On Jan. 16, McDaniels received the NCAA Silver Anniversary Award, presented to former student-athletes 25 years after the end of their college athletic careers. 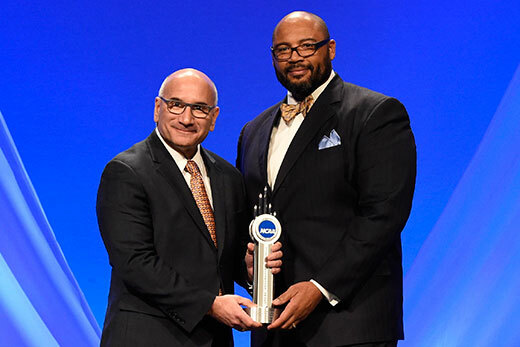 The award, given to McDaniels and five other recipients at the NCAA’s national convention in Washington, celebrates achievements since graduation. It’s "hard to say" what the honor means to him, McDaniels tells Emory Report. "On the one hand, I never expect to receive awards for the work I do in the community. I feel that being of service is part of being a citizen and a community member. At the same time, it’s nice to have people acknowledge your contributions," he says. "I never expected the kind of recognition that the Silver Anniversary Awards represents. It was a very pleasant surprise that is greatly appreciated." McDaniels was nominated for the NCAA honor by Steve Fenk, Oregon State’s associate athletic director for communications. In a recent interview for the Oregon Stater, the university’s alumni magazine, Fenk called the Silver Anniversary Award "about the biggest honor you can get from the NCAA," and said McDaniels was so accomplished that it was difficult to decide which achievements to include in the nomination. "It was amazing," Fenk said. "I was thinking, ‘What do I put in?’ You’re limited to so many pages you can include. He had honors from the NFL, for his community work, his academic work. I was thinking, ‘Where do I start, and where do I end?’ It was that hard. I had about a dozen pages of information." At Oregon State, McDaniels faced life at a school where most students were white, but most student-athletes were black. He earned accolades as a defensive lineman for the OSU Beavers, served as president of his fraternity, helped organize the school’s first vigil honoring Martin Luther King Jr., and graduated in just three years. McDaniels says he enjoyed his years at Oregon State and balancing his time between athletics and academics. "Most student-athletes learn early on how to balance their commitments to their academics and to their sport. The major difference was in the intensity of the pursuit of success," he says. "To succeed both academically and athletically, I had to develop and maintain a routine that allowed me to maximize my time." After first playing for the Birmingham Fire in the World League of American Football, McDaniels moved to the NFL where he played for the Kansas City Chiefs and the Atlanta Falcons. While playing professional football, he also found time to start two nonprofit organizations: the Arts for Smarts Foundation and the Fish Out of Water Writing Club, both geared toward elementary and middle school students. Following his nine-year NFL career, he earned a PhD in American studies at Emory, then joined the faculty. "Through my participation in sports as an athlete and my scholarly interest in the history of sports in the African American community, I recognized the significance sport has played throughout American history, especially for African Americans in pursuit of equal opportunities for social mobility, political power, and a economic stability," he says. Inspired by his own experiences as an athlete and those he studied, McDaniels has focused his scholarly research on race and sports, as well as African Americans and World War I, 19th and 20th century ideas about black masculinity, the intersection of sports and civil rights, and the politics of representation in African American art. His book "The Prince of Jockeys: The Life of Isaac Burns Murphy," debuted last year. "In my work as a sports historian and curator of African American Collections in MARBL, I examine how African American men have attempted to prove their humanity, manhood and citizenship in an effort to claim all the rights and privileges available to those recognized as deserving of that status," he explains. "My work examines the lives of people like the jockey Isaac Murphy, the boxer Joe Louis, and the baseball player Jackie Robinson, and the impact each of them had on American society." Other Silver Anniversary Award recipients include basketball player Jennifer Azzi from Stanford University; swimmer Brent Lang of the University of Michigan; basketball player Bernard Muir of Brown University; baseball player Mike Mussina of Stanford University; and basketball player Tamyra Rogers of the University of Oklahoma. Visit the NCAA website to learn more about their post-collegiate careers.